After the surrender of Germany in 1945, my father was hoping to be sent home, although fearing he would be shipped off to the Pacific Theater. Meanwhile he was part of the occupying force and after months of combat could finally relax with his friends. I had told my cousin Bob that I had donated everything I had of his war memorabilia to the National WW II Museum and he asked whether I had the film my father brought back from that time. I did not and was happy to learn that Bob had converted that old 16 MM film to DVD. He immediately sent me a copy. 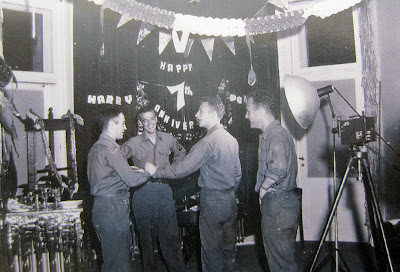 So the time machine of film allows me to post this brief glimpse of my Dad’s life at the conclusion of WW II and poignantly for me, on this Father’s day weekend. As a Signal Corps photographer he had access to color film and so this video segues to a very short but touching color film of him giving a stick of gum to a small German boy, about my age at the time. I’m sure that is why the child drew my father’s attention and patience to film this event against the backdrop of devastation to Wiesbaden. 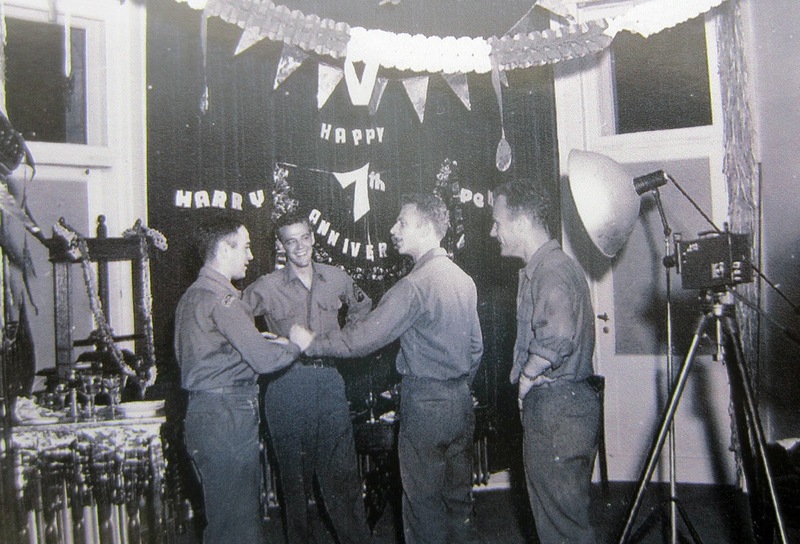 It concludes with a very poorly preserved film of a party his friends gave him to mark his 7th wedding anniversary (he’s the one cutting the cake), so that would have been early September, 1945, only days after Japan surrendered; no wonder they were all in such a jolly mood. But it wouldn’t be until the end of the year that he finally received his orders to return home. He was just 29.